Joe Vitko had to wait until the end of the AA Eastern League playoffs in 1992, but he got his call. The Mets summoned Vitko to Queens in his fourth season and Vitko looked forward to the opportunity, he told his hometown Altoona Mirror. "I am really a bit surprised," Vitko told The Mirror. "I'm really pleased and I'm just hoping to learn a lot"
Vitko learned what he could over three appearances for the Mets to end the season, but he didn't get to apply that knowledge further. He played two more seasons, but didn't return to the bigs. 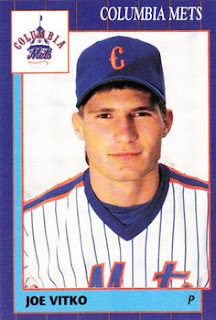 Vitko's career began in 1989, taken by the Mets in the 24th round of the draft out of St. Francis University in Pennsylvania. He played his high school ball at Central Cambria High in Ebensburg, Pa.
Vitko started with the Mets at short-season Pittsfield and in the rookie Gulf Coast League. He went 6-2, with a 2.29 ERA. He then played 1990 at single-A Columbia. He went 8-1 there over 16 outings, 12 starts, with a 2.49 ERA. A shoulder injury that led to related concerns, however, cut short his season. "It's pretty boring, man," Vitko told The New York Daily News of his post-injury routine. "I just want to be out there." Vitko returned to the field in 1991 at high-A St. Lucie. He went 11-8, with a 2.24 ERA. He then made AA Binghamton for 1992, where he went 12-8, with a 3.49 ERA. With the Mets in September, Vitko got into his three games, starting one. He gave up seven earned in 4.2 innings of work. Vitko returned in 1993, but only saw three outings in the low minors. He played his final games in 1994 at Binghamton to end his career. In 2009, Vitko participated in a baseball clinic in Johnstown, Pa. In 2016, he made a local sports hall of fame.